There are 21 days until Fall, but the weather is still too hot and humid to shift into the richer, spicy Autumn scents I enjoy (usually, it doesn't begin to cool down until mid-October); the mixture of heat and warmer fragrances would be too much for my sense of smell to handle. 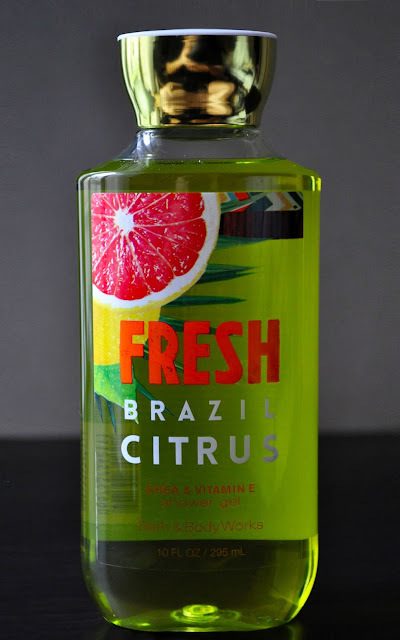 Launched in the Spring of 2015, Bath & Body Works' Fresh Brazil Citrus is the perfect transition fragrance. Top Notes: Exotic Citrus, Luscious Pineapple, Mango Nectar, Tangerine Fizz, Pomelo. Mid Notes: Tiare Bloom, Passion Flower, Peach Sorbet. Dry Notes: Sandalwood, Coconut Milk, White Musk. What a delicious fragrance Fresh Brazil Citrus is! I'm sniffing from the bottle and cupping my hands to my nose, inhaling deeply, trying to describe the scent for you all. Fresh Brazil Citrus is a mixture of luscious, mellow, tropical citrus, pineapple and coconut (without smelling like suntan lotion), with a subtle, fresh floral scent. The Sandalwood and White Musk gives the shower gel a lovely, underlying, warmth and exotic complexity. Fresh Brazil Citrus Shower Gel has a succulent aroma that befits Summer; however, the fragrance notes would harmoniously be enhanced during the cooler temperatures of Fall.